We are two guys, Bob and Bill, whose passion and enjoyment of the great taste of food and smoked/BBQ’ed meats have brought us together to form a BBQ team. 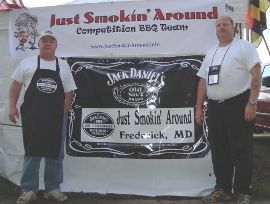 Since our primary purpose is the fun and enjoyment of producing the best barbeque meats we can, we saw ourselves as just a couple of guys who were “Just Smokin’ Around”, hence the name. When opportunity knocks, we get together, drag our smokers (and tons of other stuff!) 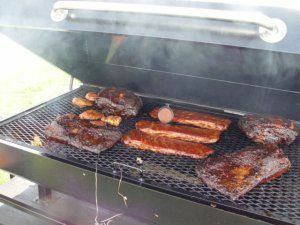 to these competitions and have a great time trying to create the best tasting meats we can; taking in the wonderful hardwood aromas as brisket, pork and chicken absorb the array of exotic and foreign spices that enhances every tender piece of meat. Win or lose, our love and passion for good food will always make for a memorable time. In the beginning, the “Just Smokin Around” team didn’t know what our destiny would be, but, we ventured enthusiastically into the world of competition BBQ . From our first unsanctioned, competition in fall of 2006 at the Trinity School in Frederick, Maryland, we knew we were hooked and wanted more. 2007 brought a first full year filled with twist and turns and surprise. We endured the record cold low temperature at our first KCBS competition, Pork in the Park in Salisbury, MD; then, we went on to bring home the Grand Championship at the Beltway BBQ Showdown in Landover, MD. 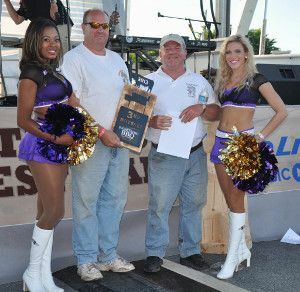 We took First Place in ribs at the Chesapeake Bay BBQ Cook-Off in Stevensville, MD to near record heat the BBQ Bash in Bel Air, MD. The GC in Landover brought us an invitation and opportunity to cook against the best teams in barbecue at two of the most prestigious BBQ competitions in the world, the Invitational at the American Royal in Kansas City, MO and Jack Daniels World Championship in Lynchburg, TN. What an incredible first year adventure for a couple of guys who were Just Smokin’ Around – from our first ever KCBS event to the Crown Jewel of BBQ, the Jack, where we brought home Second Place in Barbecue Sauce, edged out by team Switzerland by a mere 4 10,000th of a point. We’re having fun Just Smokin’ Around.